Nassau is a wreck divers paradise. 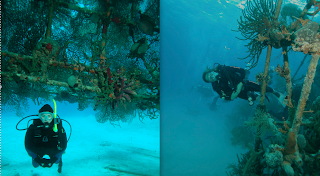 For years local dive operators have been sinking wrecks at carefully planned locations, making some fantastic dive sites and over time, artificial reefs. Since the boats are cleaned and prepared specifically with diving in mind there are lots of easy wreck penetrations available and the difficulty scale varies from advanced to easy peasy. Here is my guide to my favourite wreck dives off Nassau. 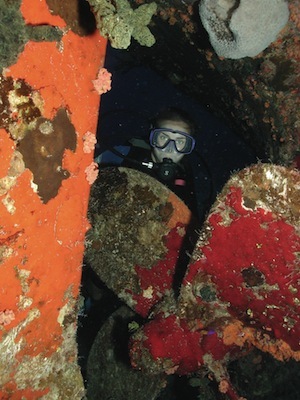 The Willaurie wreck is a favourite of most divers who know the area. She is 45m long and lies at a depth of 18m. She was sunk in 1988 and is now heavily encrusted in marine growth, the colour and variety of which makes her breath-taking. It is possible to swim in and out of the cargo hold, which is fun. The best coral colours and growth are visible at the propeller which is also a fantastic photo spot, but take a moment to scan the reef around you if you venture to the propeller as there is lots of life here. I can't imagine you'll have much spare time on a dive on the Willaurie as she is such a fantastic wreck, but if you need more, the remnants of a wooden Haitian wreck lie off the port side of the Willaurie. The Bahama Mama wreck is a battered ex party boat sunk in 1995. She is 33m long and lies on a bed of sand between reef patches at 15m depth. 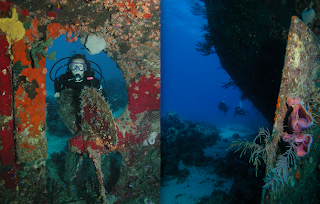 The wreck is still in good condition and having been sunk as a dive attraction, it is easy to penetrate the wheelhouse, so photos here are fun. There is a good low-lying strip of reef nearby hosting lots of reeflife but the creatures people are most excited about seeing here are the sharks hopeful of a feed at the nearby shark arena. Fancy swimming through a movie set? This is the dive site for you! Scattered over a 14m deep sandy bottomed plain, the James Bond wrecks are an unchallenging yet interesting dive. They are not far offshore and the boat ride to the site only takes about 15mins. There are two wrecks here. The Tears of Allah was featured in Never say never again. She is 25m long and sits at a slight angle. It is possible to swim inside the wreck and admire the amazing coral growth on the interior but it is very easy to kick up a sandstorm, so it is essential to be extremely careful or finding your way out again may be tricky. Just a two minute swim away, the Vulcan Bomber was featured in Thunderball. She has been underwater for over 30 years and now resembles giant scaffolding covered in coral seafans, sponges and is very busy with fishlife. Sunk relatively recently, the cessna airplane found here hasn’t much established coral growth yet, but is still fun to see. It is a bit broken up and lies on a sandy bed at about 15m atop the reef wall. It is just about possible to wriggle into the pilot’s seat, but can cost you your equipment so is not recommended. The Cessna was used in filming Jaws IV. The Cessna is only small so a dive here is spent mostly along the wall coming up to the Cessna on top of the reef before your ascent. Have you dived any of these wrecks? Which was your favourite?